Bloom Time and Color: Tiny white flowers in mid-summer. 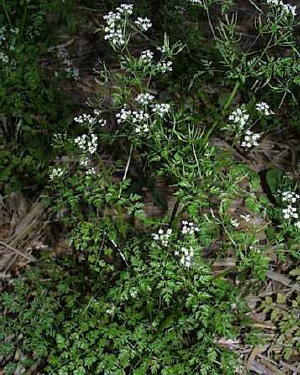 Description: Chervil is closely related to parsley. It grows to a height of 20 inches with a spread of about 8 inches. It has flat, light green and lacy leaves, which have a slightly aniseed-like aroma and turn reddish brown as the plant matures. Makes a good container plant. Finely chopped chervil enhances the flavor of chicken, fish, herb butter, vegetables, salads and egg dishes. The whole leaves can be added to creamy soups as an aromatic garnish.